Greetings from Tajikistan! It’s been more than 3 months since I arrived here in the field, and I have been all along waiting for an opportunity to write to you. Since my last letter written to say goodbye as I was leaving my role as the Director of Fundraising would be joining the medical team in the field, I have then received many letters, greeting cards, and emails, carrying kind words of encouragement and the warmest wishes. There couldn’t be a better way to wrap up of my service in the MSF-HK office, as well as to begin my journey to the medical front-line. Besides managing the medical activities, the Project Coordinator is also responsible for the security and safety of our relief workers in the field. Tajikistan is a rather stable country, but sharing roughly about 1,300 km of borders with Afghanistan, we do need to remain vigilant and prudent in our movements. With the support of more experienced people in the mission, I had produced my first emergency contingency plan for evacuation in preparation of the presidential election here in Tajikistan last month. Luckily, the election went by quite calmly, and I am very pleased that the plan was “not useful” at all! Another aspect of my role is also to represent MSF towards the government authorities and other humanitarian actors in this country. Language has then become the next challenge - as a former-Soviet Union country, people speak mostly Russian or Tajik, and only a few speak a few words of English. Conducting meetings through translators is very tricky – messages can get lost, and sometimes when I try to throw in a joke or two to lighten up the atmosphere, the reactions can be very difficult to anticipate…! This is again the area where diligence can help a little – I have begun taking Russian as well as Tajik lessons since a few months now. I hope that I will soon be able to communicate with our patients and people who work with our team in their language, even in simple sentences, as I believe this is the best way to manifest our sincerity and proximity. I cannot get too far no matter how hard I work, though, with the other challenge I face with my role as a representative of the organization – the vodka drinking culture is deeply rooted in this part of the world, and in many occasions, even during or after meetings, drinking a few rounds of vodka is quite inevitable. There was one time when I had to drink two rounds of whisky (with a tea bowl) as we wrapped up a smooth and harmonious working meeting with our counterparts! Christmas is coming and we had already our first snow here in Dushanbe. I read from the news that you are also having a very cold December in Hong Kong. I wish you a very merry holiday with your loved ones and another joyful year full of blessings in 2014! Keep warm and stay healthy! Dear Beatrice , Great Job!! I just want to say Thank you for doing such a great job overseas in Tajikistan. You are such a brave girl! I am leaving in the arctic , Yellowknife in Canada. I have been supporting MSF for a while and receiving lots of the news letters. I have experienced some mission work in the pass too in Tanzania, I understand you must have some tough time too. 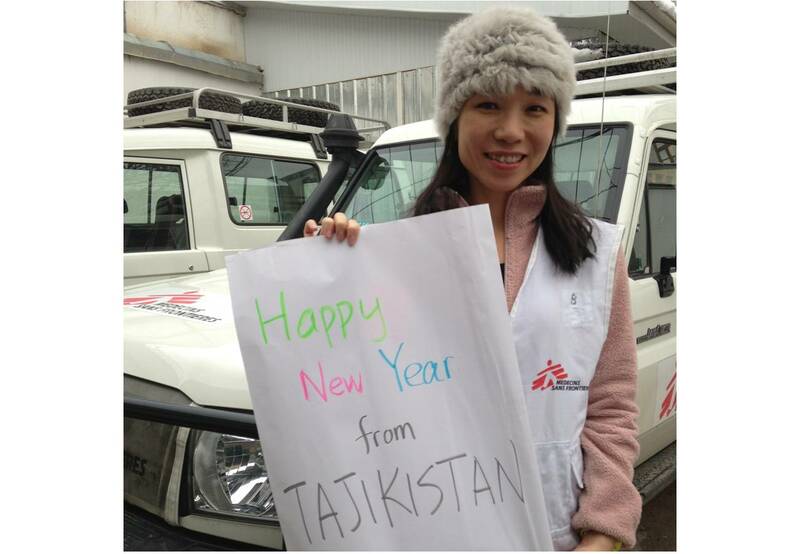 I always wants to be part of the front line with MSF too but I am not a medical professions as well. Not sure if there is any position that can help out too. anyhow, one day I know I'll be part of it too :) Keep up your good work! !